Thank you for this wonderful review. I adored The Wednesday Sisters and it sounds like this book is as good if not better. Hi Amy - Thanks for stopping by! 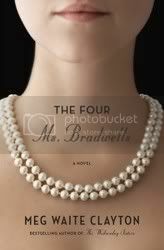 If you liked The Wednesday Sisters, I'd highly recommend reading The Four Ms. Bradwells. Hi Robin - Thanks for passing that information along!